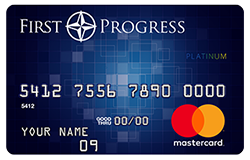 The First Progress Secured Mastercard is a full-featured credit card with credit limits up to $2,000*. Your credit limit is determined by the amount of your security deposit, not your credit score or history! The card reports to all three major credit bureaus every month to help you establish or re-establish your credit history. We will process all of your information to see you if you qualify. 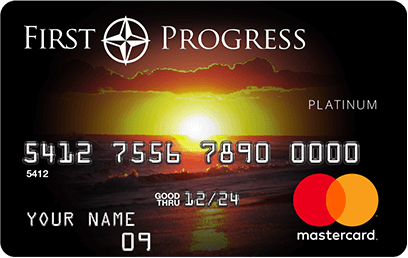 Get approved even if you have damaged credit or no credit history! Please enter all your information correctly on this application. 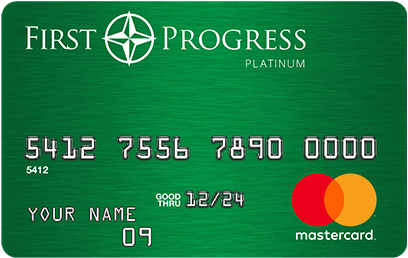 Get approved for this Platinum Mastercard Secured Credit Card regardless of your credit score or credit history! You determine the credit limit up to $2,000 with your fully-refundable security deposit. 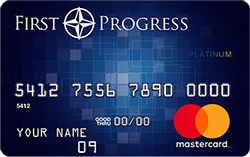 * Patriot Act Disclaimer: The USA PATRIOT ACT is a Federal law that requires all financial institutions to obtain, verify, and record information that identifies each person who opens an account. You will be asked to provide your name, address, date of birth, and other information that will allow us to identify you. You may also be asked to provide documentation as proof of identification. "Approved" is contingent verification of residence, identity and ability to repay is required. Savings Deposit will be drawn from the checking account provided.